Soooo, off to Southern Africa again for work, this being the fourth trip in as many months. Despite it being a lot of travel, it’s good for the mileage balance, and each time has enabled me to explore slightly different ways of getting there. 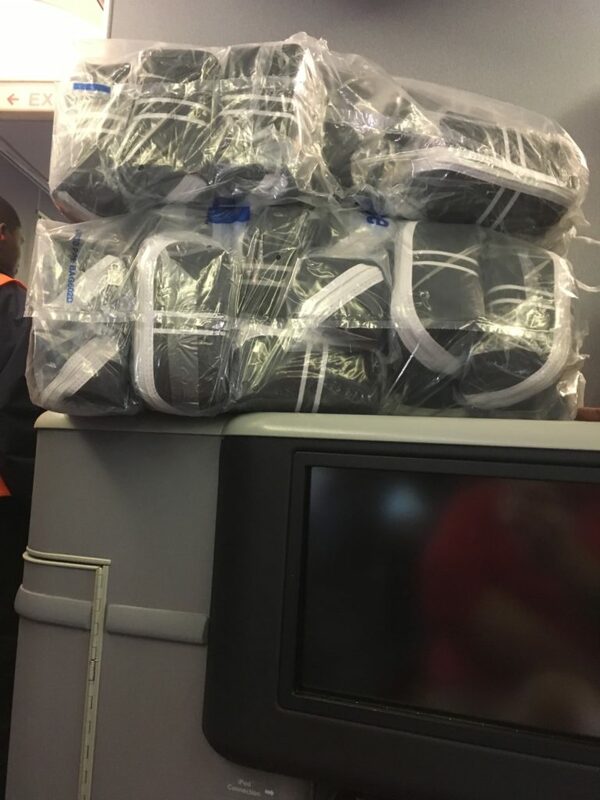 I know lots of people like the 1-stop flight on South African, but to me it’s just too long in a plane, and South African pulls way too many plane changes to risk getting the old seats. 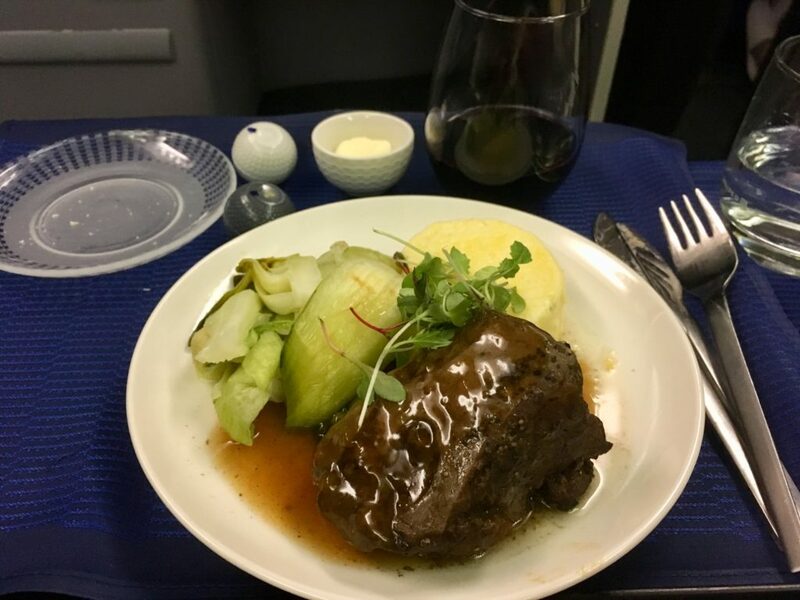 My favourite route is pretty much via Europe with Lufthansa, but unfortunately this time the nonstop flight to Frankfurt was actually sold out when I went to book! Oh well, connecting in Europe it would be. There was space on the nonstop United flights, but I refuse to pay good money to sit in their absolutely horrid 2-4-2 configuration where you get to play twister with your seatmates to get to the aisle. No ma’am. 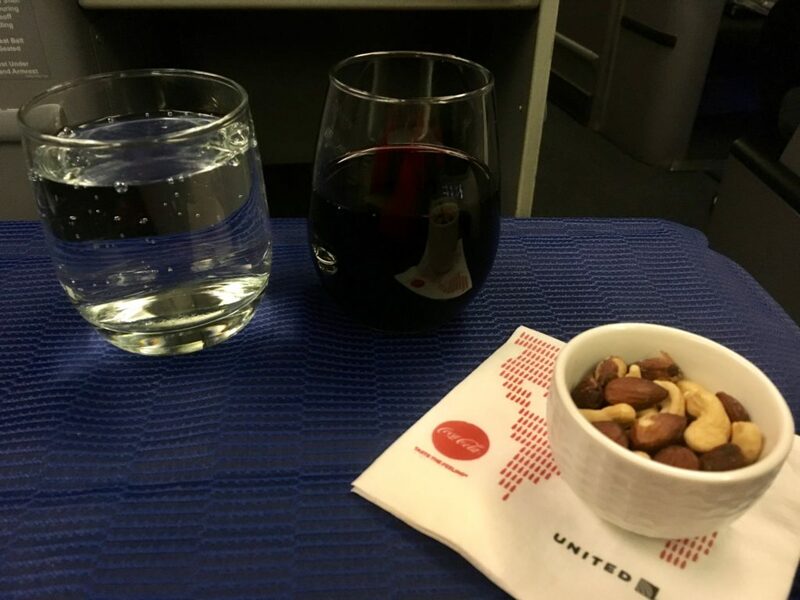 Yes, it was an upgradable fare, but there was no guarantee that would clear on United, so I went with the sure thing: a double connection in Europe where I could ensure the middle seat in United’s 2-1-2 configured 767s. Plus, there was a chance I would get “real” Polaris since there were now four of 24 or so planes configured. Unfortunately, no such luck. Right, on to the details you’re actually interested in. 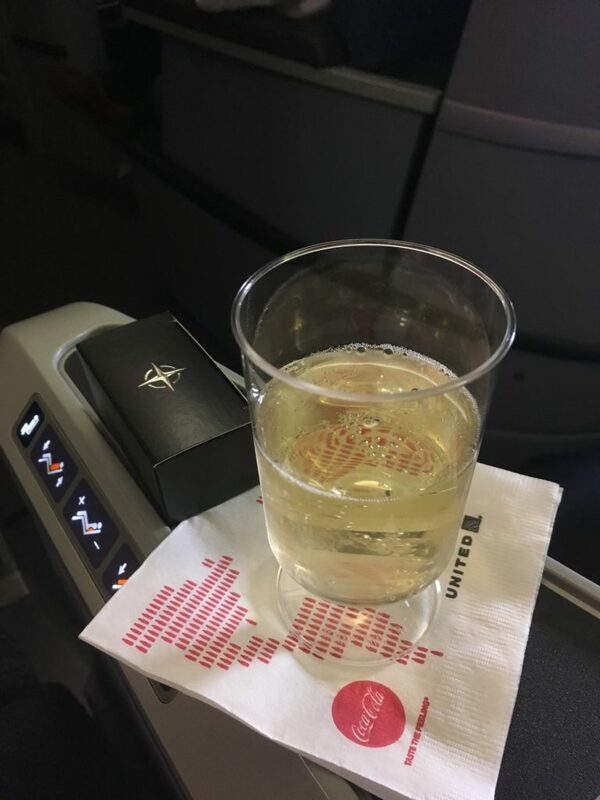 Nobody in their right mind goes to the United Clubs at Dulles at mid afternoon international rush, heaving as they are with Chase credit card holders and more star alliance gold card holders than you can shake a stick at. 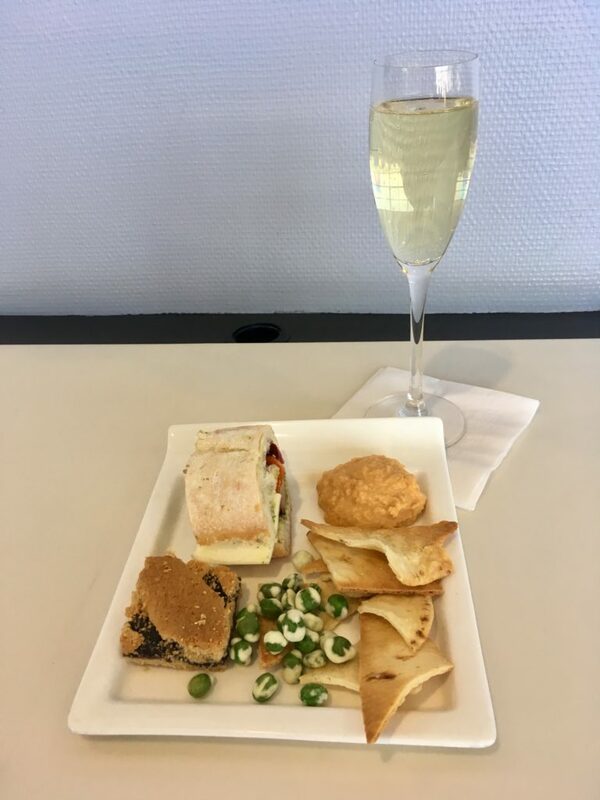 Being familiar with the shuffle, I decided a stop by the Lufthansa Senator Lounge was in order first. Unfortunately, they’ve switched to serving terrible Prosecco, so I can’t imagine I’ll be going there much longer either. Disappointing. Next off to Turkish Lounge almost right next door, but they were serving the same awful prosecco so I opted for a moderately ok glass of wine. 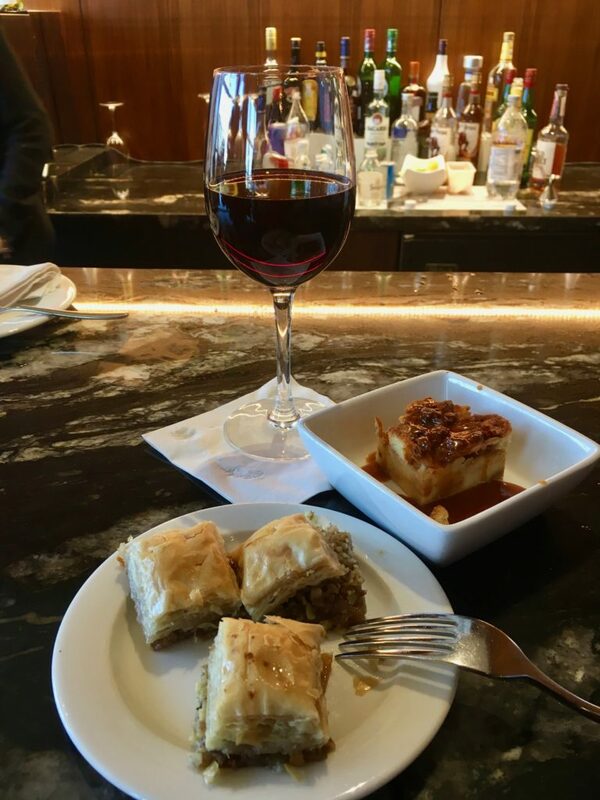 What they lack for in booze they more than make up for in delicious baklava and turkish bread pudding. Don’t judge. I may have had more than one piece. Next off to the famous Dulles “moon buggies” for a ride over to the D terminal, where my flight to Geneva was just getting ready to board. Somehow, there were no “gate lice” crowding the boarding lanes, and I was actually first in line just five minutes before boarding. Go figure. Just in time to hear a group of non-revs negotiating with their friend the gate agent and asking her “come on, can’t you move one person so we can sit together?” Ugh. Thankfully, the gate agent played by the rules. Sitting IN my seat when I boarded, but fortunately I was able to move it on top of my monitor. Yup, guess we have no shortage of amenity kits today! Welcome abord Château l’Oscar 2018 dans plastique. Appetizer of smoked duck with dried cranberries, pumpkin seeds, and mustard was almost good, but the duck just didn’t taste right. I give it an A for effort, but just didn’t quite get there. I don’t like that you don’t get to select your own bread anymore, but as the two they give you are my two favourite kinds, I forgive it. Oh, and the salad? One of the best I’ve had on United. Costs so little to improve it to this level I’m glad to see they’ve finally done it. Hopefully this is the new norm. The five spice short rib and wasabi grits? Well, the short rib hasn’t changed in years, so that was predictable. I didn’t taste any wasabi in the grits, and the sauce on the short rib had absolutely no flavour. Disappointing. Some days this dish is actually pretty tasty home cooking, but not tonight unfortunately. 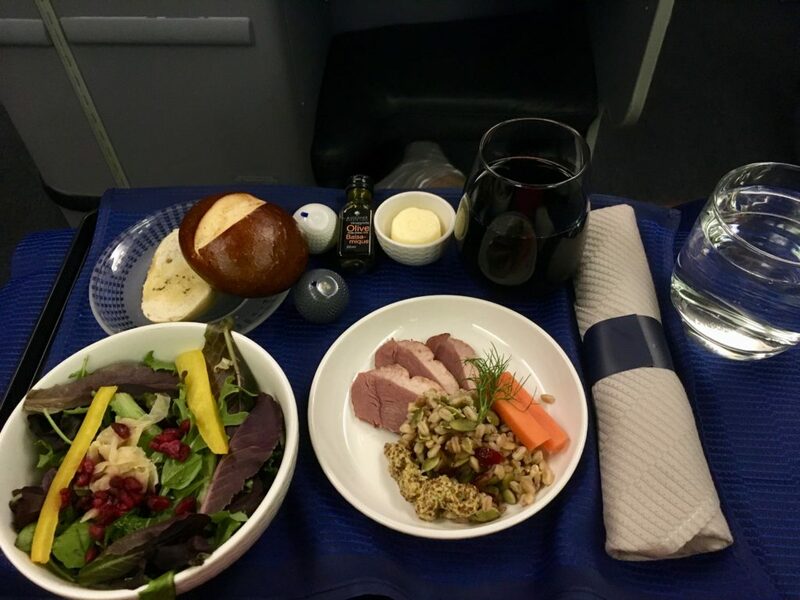 United gets a C on the cheese course this time. All I know for sure is it was “international” cheese. 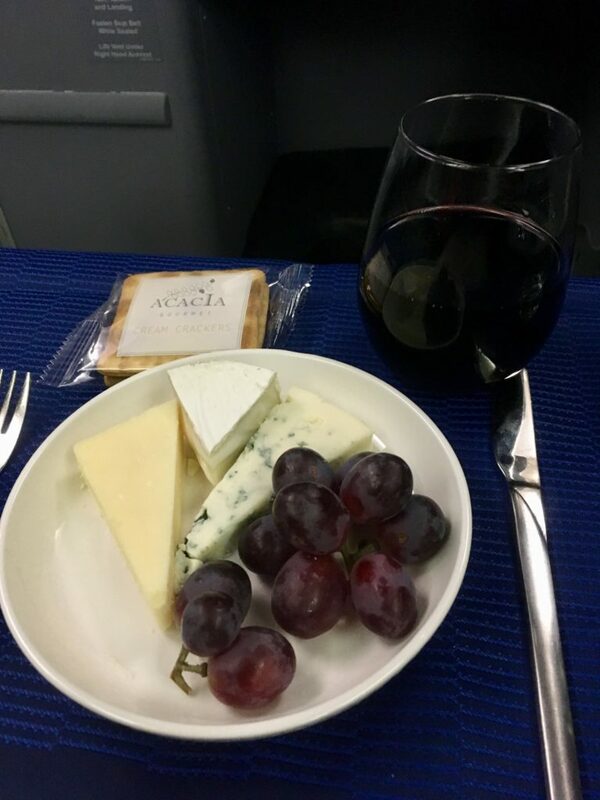 I’m going to guess a brie, blue, and what tasted like a poor imitation manchego. It’s better than the chedder and swiss they often try to pass off as international, however…. 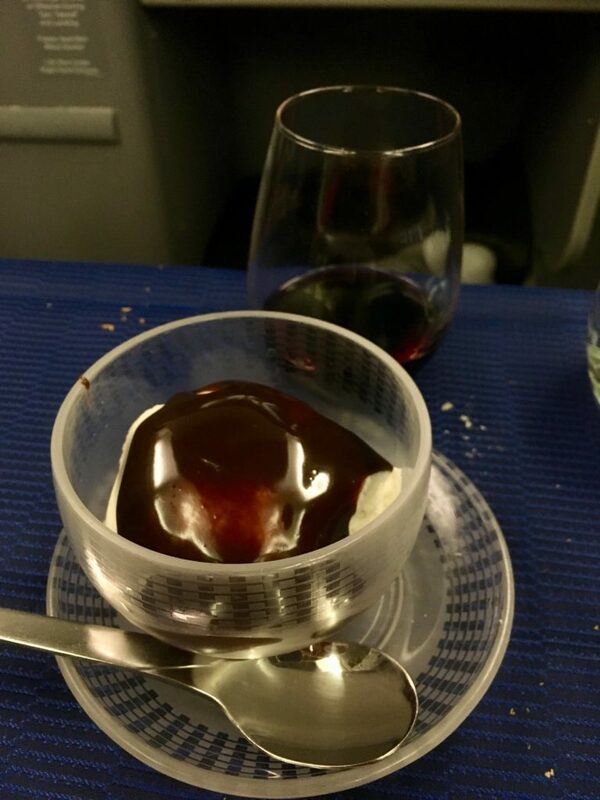 One ice cream sundae, hot fudge, no glass chips. I was told I didn’t have the option to say no to breakfast, so it was brought to me. I intentionally didn’t sleep on the flight to stay on Washington time in an attempt to battle jetlag, and so far it was working well. 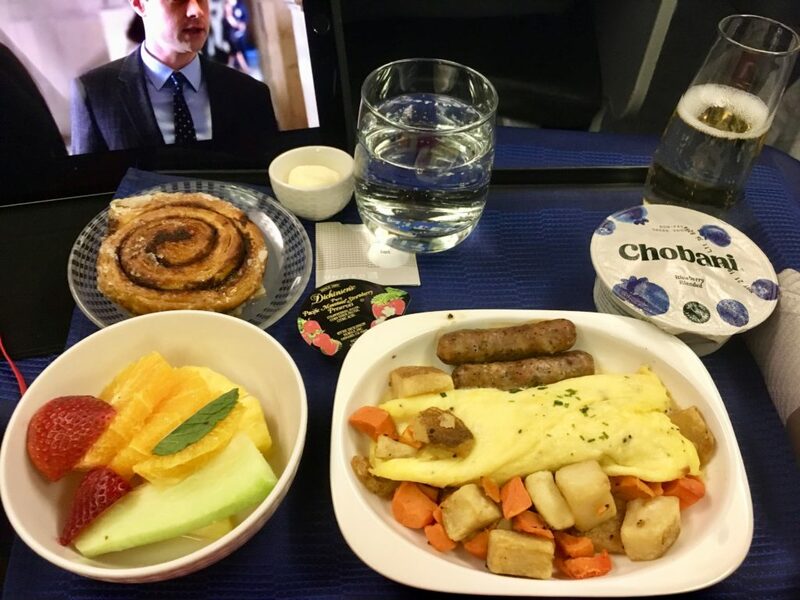 Yes, I had a champagne breakfast, don’t judge me…I think it even shocked the crew. Pretty sure they’re not used to getting that request right before landing. I had a 10 hour layover in Geneva before my connection to Frankfurt, and decided that’s when I would sleep. I tried a new website called www.dayuse.com which offered me a room at the Ibis Palexpo right next to the airport for a very reasonable rate. Unfortunately, after immigration, I jumped on the shuttle to the WRONG Ibis, and ended up walking back to the correct one, about a 20 minute walk away. The walk was actually nice after being on a plane all night, and when I got there I was ready to crash. But, the room…like many European hotel rooms, was WAY too warm and of course there was no air conditioning since it was April, so I had the pleasure of sleeping in a 25C room. At least after a shower I was ready to completely peace out for five hours. Overall impression of the hotel? The room was a small cube with barely enough room for the bed and a desk, but it was perfectly functional. This was supposedly the nicer of the two Ibis properties as well. That said, it was a bed, and it was functional for that. The lobby looked to be a bit of a refugee camp with people on long layovers, and lots of small children, but the room itself was quiet. If not for the heat, it would have been absolutely perfect….plus where else can you get a 79 franc room in Geneva for 10 hours?! Checked out after a wonderful solid nap, well worth every penny, and back to the airport to enjoy the lounge a bit. 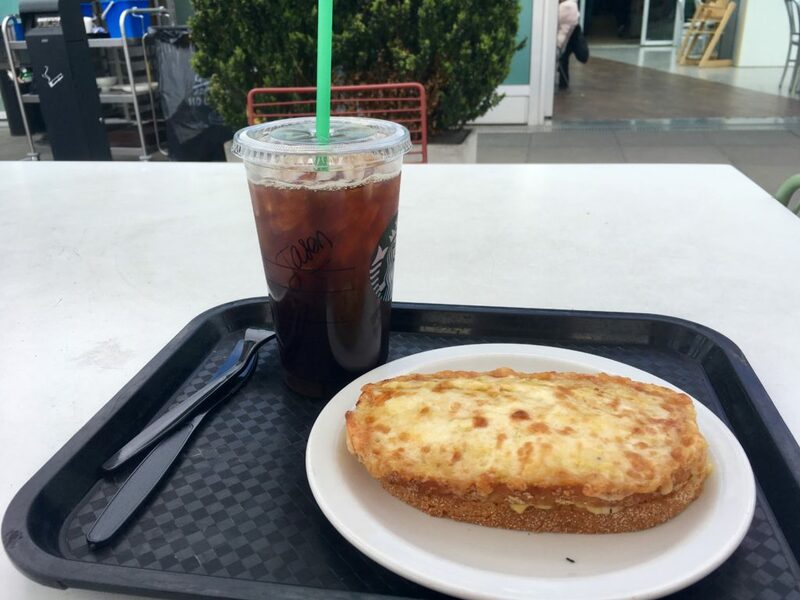 But first, random snack at Starbucks. Not sure it’s a meal or what, but it was nearly $18…who said Geneva is expensive…. Overall lesson so far: this routing to South Africa works. Flight leaves DC too early to sleep for me, but gets to Geneva just in time that I want to sleep…and sleep came easily. The United 767 certainly isn’t cutting edge, but if you get one of the middle seats it’s not a bad product. Overall, I was happy with my choice, and it was time to head to Frankfurt now! First off apologies that this will be mainly a text post. I don’t know why I didn’t take more pictures on this leg…but just didn’t. Got up pretty early to catch an early breakfast at the hotel in Swaziland, which was fascinating on its own. The buffet area was small – a dozen tables or so at the Mountain Inn – and most will filled with large South African tour groups. Regardless, we got a good breakfast, and got ready to head on our way. 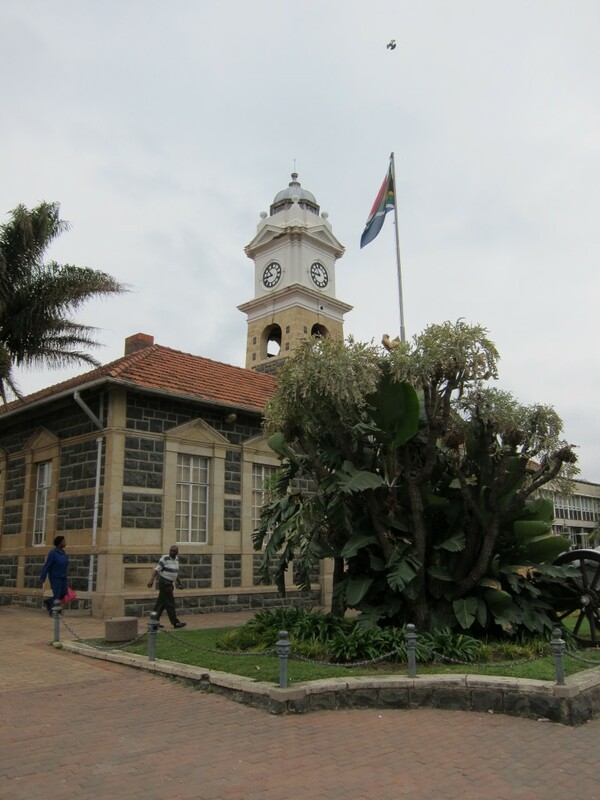 We’d planned to head out of Swaziland on the northern side via Pigg’s Peak, but there was very very thick fog, and the front desk advised us this route would not only be dangerous, but we were unlikely to see anything at all. Oh well – can’t control the weather! Headed out via the west, and it was still very foggy. 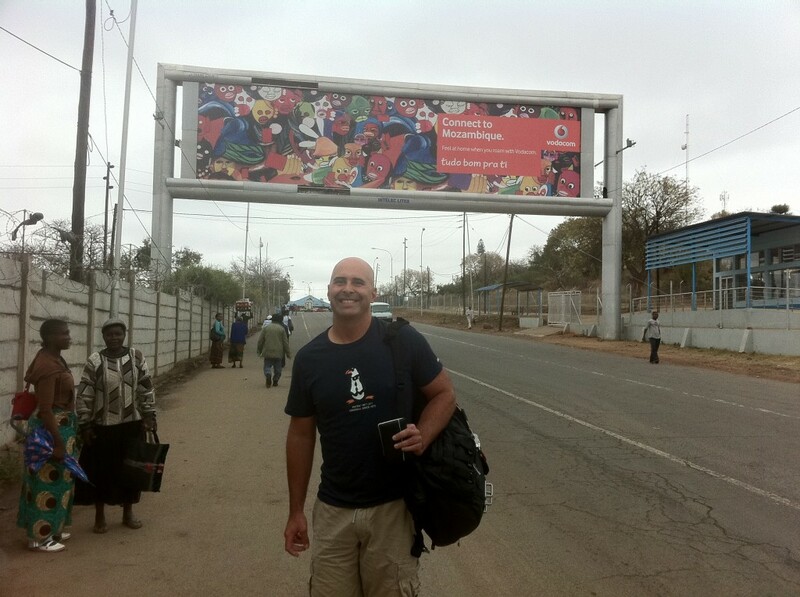 We had to get to Nelspruit, South Africa where we were due to catch a Greyhound bus to Mozambique. The drive was slow and quite foggy, but we still made it in plenty of time. Dropped off the car at the airport, and caught a way overpriced taxi back to the bus terminal. No problems at all – which in and of itself was quite surprising. Bus was even on time!